We’ve all seen them, those dates that look a little scary – “sell by” “use by” “best by” – but what exactly do they mean? Do you need to pour your milk down the sink as soon as you pass the date on the carton? Does that peanut butter magically go rancid at the end of the year? It turns out, that’s not the case. Actually, the Food and Drug Administration only required that infant formula have dates. The rest of food dating is regulated on a state-by-state basis, and not every state has food dating requirements. The “best by” date on my sour cream in the photo below is a little different. This means that, according to the manufacturer, after 9/7/12 the sour cream won’t be bad, per se, but it might not taste as good – maybe there will be some separation, or the texture will change a little bit. But, again, with proper storage, this does not necessarily mean that I need to throw it out on September 8. The “best if used by” date on this peanut butter means the same thing as the “best by” date. Then there’s the “use by” date, from this organic milk carton. And this “use or freeze by” date, from a package of turkey sausage. (Don’t worry, these are old photos, neither of these are in my refrigerator!) Similar to the “best by” date, the “use by” dates are recommendations from the manufacturer about the peak quality of the food, not necessarily the day the food magically goes bad. But proper food storage is essential to be sure your food is safe after these dates. Here’s the bottom of a tuna can. it has a “best by” date, but it also has this jumble of letters and numbers below the date. (The peanut butter label above has a similar jumble.) This is called a “closed” or “coded” date. This is strictly for the manufacturers so they can track their products. It’s more like a serial number than an actual date. I’m sure back in their computer systems it does correspond with the date this tuna was canned, but there is no easy way to translate this jumble into a date. Go by the “best by” date, and you’ll be fine. 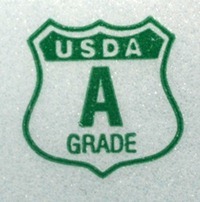 Any eggs with the USDA shield are required to have a “pack date.” That is the date that the eggs were washed, graded (in this case Grade A), and packed in the carton. This is always a 3-digit date that corresponds to the day of the year the eggs were packed. January 1 is 001, and December 31 is 365 (except in a leap year). The eggs in my refrigerator were packed on day #195, which is July 14. If the eggs have a sell by date (mine do), it must be less than 45 days from the pack date (mine is 28 days). Check out this post for more information about the codes on egg cartons. No matter what the date on the package, if the food wasn’t handled appropriately, the dates don’t matter. For example, if you forget that gallon of milk behind the seat of your car for an hour in this 100-degree weather we’re having right now, I don’t care if the “sell by” date is still 2 weeks off. That milk isn’t going to be good anymore. The mayonnaise that gets left on the counter in the sun all afternoon because you forgot to put it away after making a sandwich? Same thing… improper food storage and handling means the risk for bacterial contamination of any food goes up. And no one wants to take that risk. The United States Department of Agriculture has some more information about food labels and food safety. I’ll be covering food storage and safety concerns here next week, so come on back! Are there any other food labeling or food safety questions you have? Thank you for the clarification. I’m paranoid about food safety, I did the ServeSafe certification and was an instructor for a few years, looking forward to your posts! I’m glad this helped! Because there are no strict “regulations” on what the dates mean, it can get very confusing.